Megan and I always have our ears open for new brands and when they have a San Francisco connection, we are even more compelled to check them out. A few weeks ago I blogged about Everlane's new storefront in the Mission. It was so fun sharing some of my favorite picks from their collection, that when I heard about Modern Citizen I dragged Megan along to shop the store for our clients and blog readers. Our take? This may be your new destination for basics. This brand has been thoughtfully curated for a San Franciscan wardrobe but applies to anyone looking to freshen up their basics routine or add a modern feminine piece to their closet. Perhaps we have been living in the Bay Area too long, but finding a good quality $30 tee shirt (see here and here) with a flattering cut was refreshing. For certain pieces, we were giddy with happy sticker shock. The price points are sharp and the cotton and rayon blends are soft. From what we found they are still fine tuning their sizing consistency in certain pieces (we are tough critics). In chatting with the co-founder who happened to be manning the racks when we were shopping, most of the products are produced in China and a small number in LA. We would love to see that number flipped in the future but it also enables the reasonable pricing. In addition to focusing on the key clothing pieces everyone should have in their wardrobe, Modern Citizen sells and manufactures a limited number of staple jewelry pieces that are 14 karate gold or sterling silver. If you are a jewelry minimalist who wants to invest a little more but not to the extent of fine jewelry, this is a great option to explore. Earrings range from $32 to $198. This fall tortoiseshell is having a moment so consider these hoops for a fashion statement or keep this simple and invest in this classic metal drop earring. Last Fall I invested in the J.Crew Sweater Blazer (see the story here) and have been possibly "over-wearing" it this year as a light jacket. When I tried on Modern Citizen's long Sweater Coat cardigan in store I was smitten. 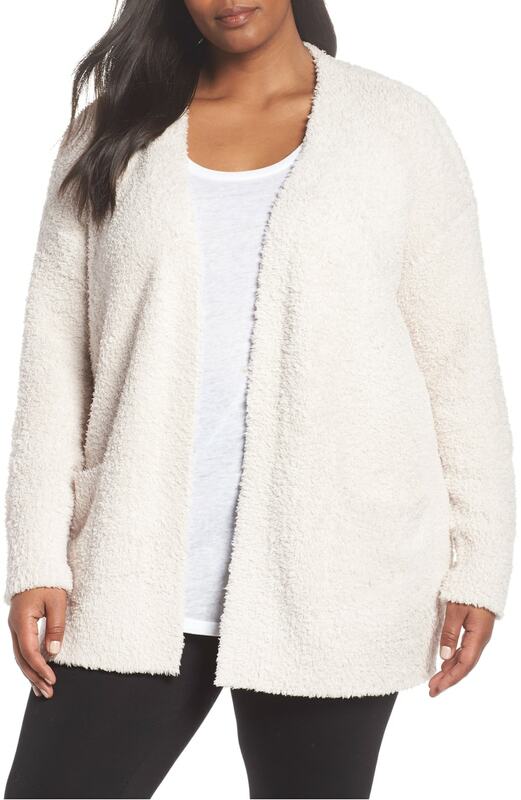 Longer cardigans are back in vogue this fall and this $92 cardigan is a great steal staple. The longer knee length and charcoal grey color transitions well from weekend to a casual office day. We paired the cardigan with the Brooke High Waisted Ponte Pants and the Lindy V-Neck tee for a sporty chic look. Similar to my camel blazer, this item is dry clean only but if you take good care of it, it shouldn't require much upkeep. It's an acrylic, polyamide, and elastane blend so if you run warm during the day it might not be the best match for you. Modern Citizen does offer a lighter structured cardigan that hits at mid-thigh that could be a good alternative. If you are looking for that Friday to Sunday outfit--consider Modern Citizen's Side Zip Cashmere Sweatshirt. This piece is as stylish as it is comfy. The hint of cashmere blended into the fabric makes it oh so soft and we love the side zipper that can be styled slightly open for warmer days. Pair it with light jeans or a fitted skirt now and enjoy it with work trousers or coated denim come fall/winter. Details: Modern Citizen Side-Zip Sweater $88, Everlane Kick Crop Jean $78, Cole Haan Pewter D'orsay Flats (similar in silver $68 on sale). Posted on August 17, 2018 by Kimberly Gant and filed under SF Shops, Style Stories and tagged Sf shopping Modern Citizen SF Style Shop Local Basics Budget Style Essentials Sweater Cardigan. It's that time of year again - the Nordstrom Anniversary Sale! This is one of our favorite annual events because Nordstrom offers great discounts on new Fall items. It may feel early to stock up on sweaters and boots, but trust us that you won't want to miss out. We've scoped out some of the best buys for men, women, and home and are excited to share them with you! Pro tip: The sale opens to the public today, July 20th. If you see something you like, act FAST! Things tend to sell out at the speed of light. "I have clients who wear by this local brand--I've been waiting for this sale to test them out myself and am excited to try them at a discount. The color mix is perfect for fall a few months away." "The Nordstrom sale is a great time to replenish basics that you use all year. Underpinnings are no exception. This bra from Natori is incredibly comfy and comes in a mix of fun shades." HALOGEN® Long Open Front Cardigan $59.90 (reg. 89) "Long cardigans are back and big for fall. Halogen and Caslon, both private labels for Nordstrom, have some in many colors at a great price." "This is my go-to moto for clients who want a quality suede jacket at an affordable price. I own it in bright blue and it's on constant rotation in my closet." "Zella is my favorite brand for athletic and athleisure items. This high waist leggings keeps everything in place while working out and they are super comfortable." PATAGONIA Better Sweater Performance Slim Fit Quarter Zip Jacket $88.90 (reg. $119) "A staple in any guy's closet in the city. I'm partial to the light grey to wear with button-downs during the week and a tee on the weekend." BARBOUR Pod Slim Fit Water Resistant Quilted Jacket $132.90 (reg. $199) "Water-resistant style James Bond would approve of." "This is one of my favorite belts for men. The quality and color make them wardrobe staples that last." "You can never go wrong with a Theory jacket. As a client said yesterday, "It just feels like and effortless while I am wearing it." Enough said!" "My #1 recommendation for men wanting a comfortable pant that is stylish. It is a cross between a jean and a chino and comes in tons of different colors." "My male clients love this boot. It is super comfortable and looks great with everything. It only goes on sale once a year." "I like to keep small gifts on hand for birthdays and impromptu celebrations. This candle set is a perfect way to stock up and you may find yourself enjoying a candle too." "Aveda is great for all types of hair, especially color treated. This set has it all and is enough to last you a year." Posted on July 20, 2018 by Kimberly Gant and filed under SF Shops, Style Stories and tagged Nordstrom Anniversary Sale Nurse Jamie Aveda Voluspa Timberland AG Theory Magnanni Barbour Patagonia Zella BlankNYC Stuart Weitzman Halogen NAtori Stance.